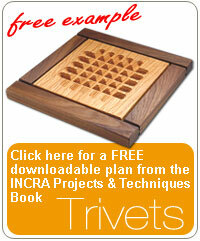 Sorry, the Project Book is not directly compatible with metric INCRA fence systems. Please read the Term of Agreement. (To access your downloadable product, please login to your store account and click Review Orders/Track Packages under My Account). Written by INCRA expert Perry McDaniel, "Projects & Techniques" features step-at-a-time plans more than a dozen original projects and 11 special techniques sections that will turn you into a real INCRA pro. This 148 page book contains detailed plans with over 400 illustrations and photos is now available in a downloadable PDF format. This isn't just a collection of project plans, it's a gold mine of information for owners of any generation of INCRA System. Some of the book's greatest value is that it teaches you to take advantage of the accuracy and repeatability of the systems in ways that you might not expect, and then use those methods to improve the projects you're already working on. About half of the projects are based on box joints and dovetails, and the rest are non-joinery projects that use a variety of router table and table saw techniques. As an added bonus, FREE templates are included for making the spectacular INCRA Double-Double Through Dovetail and INCRA Corner-post Eagletail. Includes clearly written instructions for each variation (templates sent by mail). Note: Although the techniques illustrated are valuable for all INCRA fence systems, the project plans are not in metric format and the additional templates are not compatible with metric INCRA fence systems. Please click here if you wish to purchase the hardcopy. Try our new, mobile friendly INCRA Projects & Techniques flip book! Just click the link from your device(s) and be sure to bookmark the page for future use. Login info will be provided once payment is processed. If you forget your login information or need assistance, please include the order number and send an email to: cindy@incra.com. Preferred to download the booklet directly? No problem! You must have the FREE Adobe Acrobat Reader installed. Please save the PDF file on your local desktop first. It might take several minutes to save the file depending on your internet speed. Software installed to view this file. If you are not able to view the book or you do not have Adobe Acrobat installed, you may download it here. Simply follow the instructions provided by Adobe. Recommended internet browser IE 11 & up. how about the dovetail templates? The Project Book's bonus dovetail templates will be sent to you by mail. If your account has more than one address, please specify which address you prefer to use for the templates in the Order Comments section as you check out. You can also access your downloadable product by login to your store account and clicking Review Orders/Track Packages under My Account. Choose the right order history and download this product in pdf format.